With the new Material theme we have introduced a new approach to add icons and icon-like images. We are providing font "glyphs" via custom fonts. The glyphs are vector symbols that can be used as information-carrying icons or interaction indicators. The glyphs are vector paths which are easily scalable without loss of quality. There is a wide range of different beautiful built-in glyphs to choose from. They are easily colored – since they are text shapes. It is achieved by setting a Foreground color, which allows their usage in scenarios where the background of the control changes between light and dark color in different interaction states – e.g. buttons. They are available for use in any of our themes. They are not specific for the Material theme. The TelerikWebUI font provides over 400 individual glyphs. We have chosen this approach to define the icons in the Material because it provides a number of advantages and benefits. The following article lists all available glyphs from the TelerikWebUI font along with their names, number and string values: Glyphs Reference. This is an open source font consisting of close to 1400 icons. 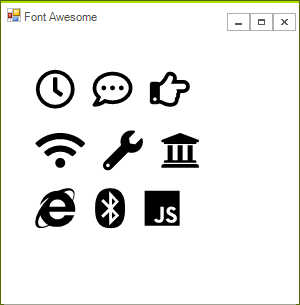 The Font Awesome pack has three different types. Me.radLabel1.LabelElement.CustomFont = "Font Awesome 5 Free Regular"
Me.radLabel2.LabelElement.CustomFont = "Font Awesome 5 Free Solid"
Me.radLabel3.LabelElement.CustomFont = "Font Awesome 5 Brands Regular"
Me.radLabel1.Text = "\uF017 \uF4AD \uF0A4"
Me.radLabel2.Text = "\uF1EB \uF0AD \uF19C"
Me.radLabel3.Text = "\uF26B \uF293 \uF3B8"